On the first floor are local specialty display, management office, comfortable lounge, chroma-key photo zone, food court and theater facility. 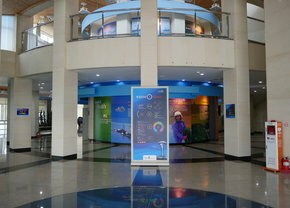 In the chroma-key photo zone, visitors can take photos using image fusion, and theater facility is promoting Wando with various videos and sounds symbolizing Wando under the themes 'healthy island', 'slow city' and 'sounds of Wando'. On the second floor are photo zone and people of Wando. Image bench decorated by marine products of Wando is placed on the view point deck connected to the outside, and visitors are welcomed to take photos with golfer Choi Kyung-Ju and Jang Bogo. 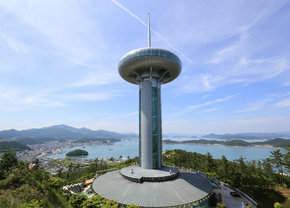 In the observation floor are video monitors and observation binoculars offering beautiful scenery of the archipelago as well as Wolchulsan Mt. in Yeongam and even Jeju Island in a glance. On the exterior of Wando Tower are exterior lighting designed to create beautiful appearance of Wando Tower at night and fantastic laser show. 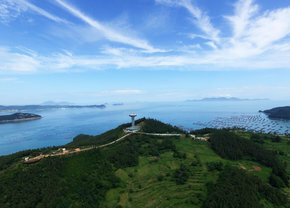 Attraction of Wando offering archipelago in a glance. 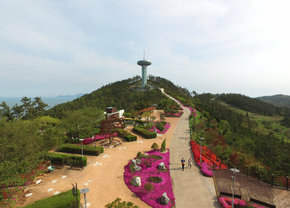 In the small garden is an view point deck to enjoy natural scenery in the area offering the view over Wando in a glance, and a dome pergola in the shape of a mast on sea is installed to emphasize the local image of Cheonghaejin. Also, various wild flowers of the season are planted in the small flower rain garden, and unique structural planting space was formed using pipe structures. Also, symmetrical planting pattern and facilities are used in smile garden for eccentricity.